Made by Rain porcelain is nominated for the Open to Art award at the Milan gallery Officine Saffi. 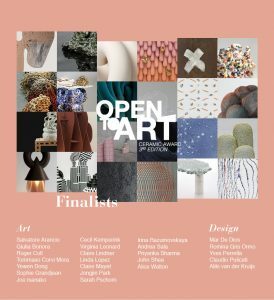 Open to Art is a biennial competition that aims to recognise the role of ceramics in contemporary culture, art and design. 24 shortlisted artists will be exhibited at Officine Saffi gallery from February 14th through April 18th 2019. During the opening reception – on February 13th – the jury will announce the winners. The finalists have been selected amongst 400 candidates over 45 nationalities by an international jury comprised of 8 experts from the art and design world including Felicity Aylieff (artist, Head of programme Royal College of Arts, London), Laura Borghi (Officine Saffi), Flaminio Gualdoni (journalist, art critic and professor at Brera Academy of Fine Arts), Tom Morris (editor and consultant specialized in design, interiors and architecture), Isabelle Naef Galuba(director of Ariana Museum), Elisa Ossino (architect, stylist), Ranti Tjan (director of EKWC) and Matteo Zauli (curator, director of Carlo Zauli Museum).